The windows are open, the morning temps are in the 50s and evening temps are in the low 70s. My sweaters are begging to be worn and my wool socks are starting to peak their heads out of my drawers….fall is finally getting here after a looooooooong summer. 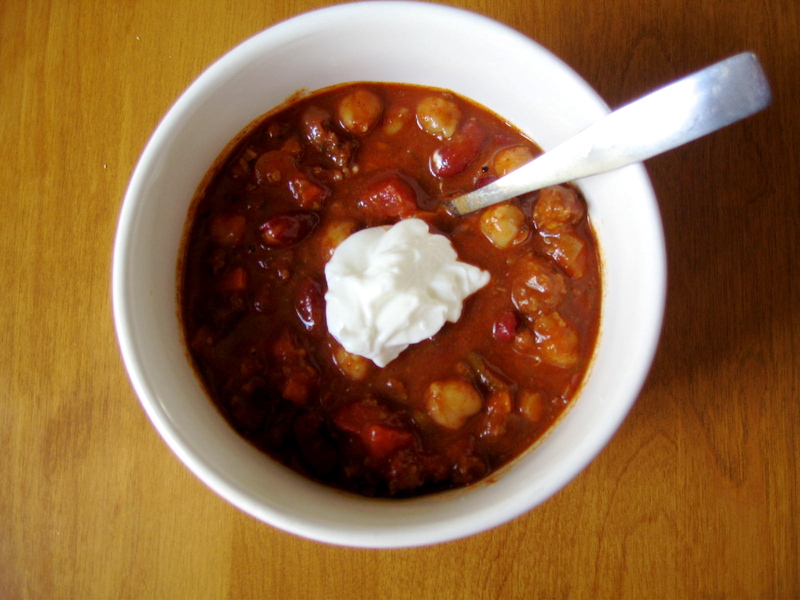 And there is nothing that I like to celebrate fall with more than an awesome bowl o’ chili! …seriously, nearly 1/3 cup of chili powder…dump that stuff in…go on….it’s called CHILI for a reason folks. And that’s mainly it. From there, you can dump add a myriad of other items to this pot o’ awesomeness. This week, my cabinets were a bit sparse and I had just harvested veggies from the garden. So my chili was more of a garden medley than normal. To the above formula, I through in some diced carrots from the garden, tomatoes, a purple bell pepper, a jalepeno, a hungarian wax pepper, and parsley. I only had garbanzo beans and red kidney beans, so those jumped in as well. And to top if off, a pound of local bison meat. If you have never tried bison, do it. It’s lean and a great grass-fed meat option. mains. Drain meat. Add onion and sauté for 5 minutes until onion is translucent. Add garlic through carrots and cook over medium heat for another 5 minutes until vegetables are slightly tender. Add tomatoes, tomato sauce, water, and spices and bring to a simmer. Cover and cook for about 30 minutes or 45 or until you are ready to jump in. Add beans at the end so that they do not become tough. After adding beans, cook for another 10 minutes. Salt and pepper to taste. Now dig in!